Albemarle Street, just a tottering stiletto step from the hustle and bustle of Piccadilly and the designer fashion boutiques of Bond Street, has remained the epitome of Mayfair luxury and style since the 19th century when it was the haunt of many famous writers; Jane Austen and Lord Byron shared the same publisher, John Murray, whose home and office was located at number 50, where he entertained the writers ‘on his books’ with afternoon tea at four o’clock. 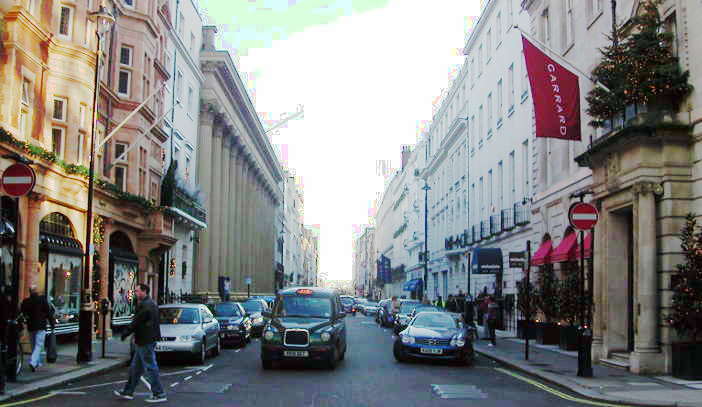 In 1837 (the year of Queen Victoria’s accession), Lord Byron’s former valet, James Brown, and his wife Sarah (Lady Byron’s personal maid) opened Brown’s, London’s first hotel, having taken a lease on 23 Dover Street. The husband and wife team clearly knew how to look after genteel folk and gradually expanded the hotel to encompass properties on the adjoining Albemarle Street. 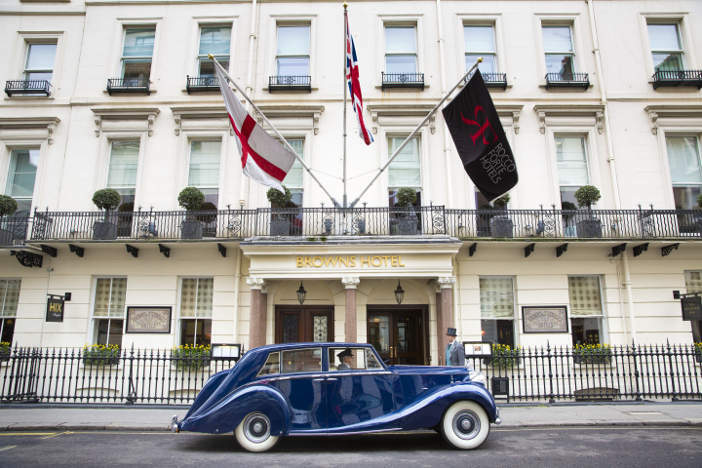 Now the 117 room hotel occupies 11 Georgian townhouses, where guests still relish the atmosphere of history and tradition, and the Rocco Forte hotel group upholds James Brown’s reputation for understated elegance, whom Lord Byron described as “the gentleman of gentlemen”. Alexander Graham Bell visited the hotel in 1876, where he made the first telephone call in Britain, and from American President Theodore Roosevelt and Prime Minister Winston Churchill to royalty and A-list stars, the hotel itself has become a legend. It was also the setting of Agatha Christie’s 1965 crime thriller At Bertram’s Hotel, in which she draws on the cosy wood-panelled English Tea Room once patronised by Queen Victoria. By comparison, Bertram’s is considered quaint, if a little out-dated, by the characters staying there, with a pontifical butler presiding over the afternoon tea, complete with silver teapots and seed cake. The street was also the home of The Albemarle Club, where in 1895 the Marquess of Queensberry left his calling card for Oscar Wilde, along with the infamous note “For Oscar Wilde, posing as a sodomite” which led to Wilde’s failed libel action and subsequent criminal prosecution. You’re probably oblivious to all of this as you visit one of the city’s leading art galleries, take in a scientific lecture at the Royal Institution (number 21), shop for diamonds at Tiffany & Co (number 15), or have your hair styled at Michael John Salon & Spa (number 25). The ultimate Albemarle afternoon might combine all or just a few of those activities, but for my part, there is nothing more enjoyable than a stroll down the Royal Arcade (number 12), to go in search of pink champagne truffles at Charbonnel et Walker, before checking into Michael John across the street for a ‘glamorous cut and beautiful blow dry’ with Neave O’Hara. Having opened the Mayfair branch in 1967 (still a relative newcomer in this historic street), the world-renowned coiffeur Michael John has a loyal following, but opening the Spa in 2013 enticed new clients, whilst offering existing ones the convenience of being able to combine hair and beauty treatments on the same day in a luxurious and central setting. Bathed in flattering lighting and heavenly-scented thanks to elaborate flower displays, with Brown’s Hotel referring many of their guests to the salon, it proved an ideal spot for people-watching in between reading Vogue magazine and gossiping with Neave. The lady next to me, who clearly liked to invest in her appearance, was making full use of the manicure services whilst her hair was being curled Dallas-style. Neave had meanwhile made me look and feel the part, being extremely attentive and keen to provide the hair cut I wanted – leaving me to swish my sleek new hairstyle at passers-by en-route to Brown’s, just a few doors down, where I met my chap for the famous afternoon tea, quickly refusing the healthy ‘Tea Tox’ sugar-free option – this being no day to be virtuous. With a pianist tinkling on the ivories, we were served a glass of Ruinart NV and spent the next two hours (the welcoming staff allowing us to forget the turn-around time on the table) indulging in perhaps the nicest of all British traditions; loose leaf Earl Grey tea served in porcelain tea cups, an unlimited supply of dainty finger sandwiches, proper slices of cake ‘from the trolley’ and freshly baked scones – served with perhaps the most delicious home-made strawberry jam in the world. There is nothing quite like spending the day on dear old Albemarle and, in my opinion, no need to venture onto any other street in London. 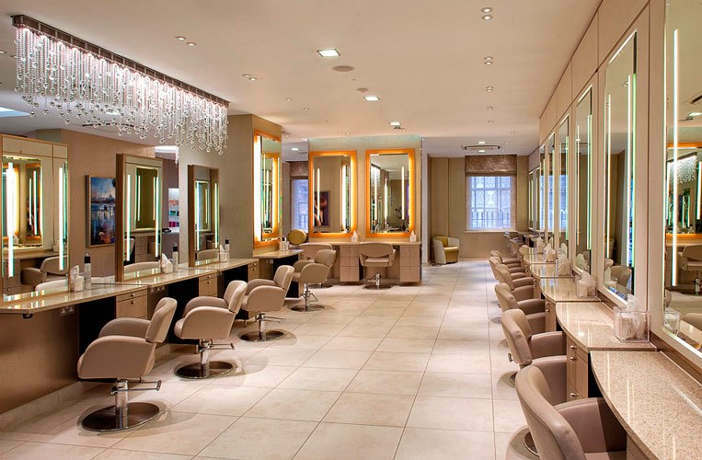 For more information on Michael John Salon & Spa Mayfair visit the website. 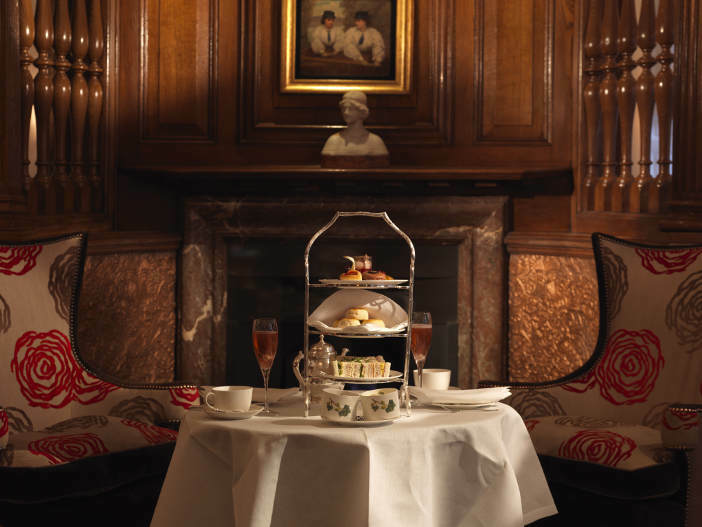 Or Click here for Afternoon Tea reservations at Brown’s Hotel.